I recently reported signs that wealthy investors were migrating away from prime residential property towards commercial property. Now Property Week has provided a really useful analysis of the London prime residential market and it's well worth a read. I've attached a link to the article below. 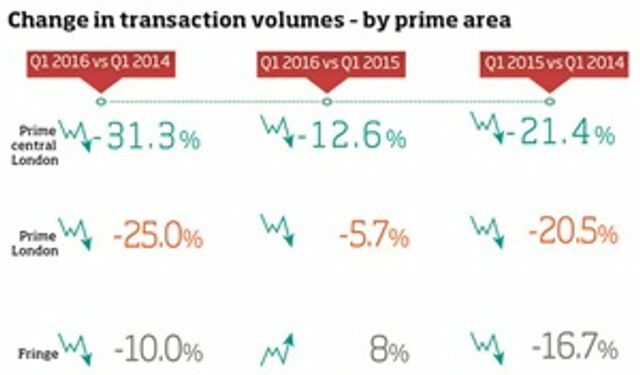 Transaction volumes are over 31% down for central London prime properties from a peak in 2014 and prices per square foot are down too. The big question then is whether things will get worse and this rests on confidence in the market. Property obviously has an intrinsic value: if you buy a house to live in and the value of the house goes down, you still have a house to live in. But to an investor (and to an extent we have all become property speculators) all that matters is that the asset appreciates and if an investor is not confident of that they'll put their money elsewhere, perhaps commercial property. At present confidence is low in the prime end of the market and this seems in large part to be a result of the upcoming EU referendum. For many people, this probably isn't going to affect their house prices, but for the people investing in prime property a decision to leave the EU could have significant implications. And nobody knows which way the vote will go and exactly what the implications are going to be. All that uncertainty is bound to shake confidence and the housing market with it.